Like N-WASP, Pakl catalytic activity is regulated by an autoinhibitory domain whose binding to the catalytic domain is released on binding-activated Rho GTPases (Lei et al. 2000). Unlike in N-WASP, however, the interactions between the Pakl autoinhibitory domain and the catalytic domain occur between two Pakl monomers in trans, resulting in the formation of an autoinhibited "head-to-tail" Pakl dimer (Fig. 2 and Parrini et al. 2002). The autoregulatory region of Pakl is made up of distinct sequence elements: the GBD element overlaps partially in sequence with an element termed the inhibitory switch (IS) domain, which anchors the autoregulatory domain of one Pakl monomer to the kinase domain of the partner Pakl monomer. C-terminal to this element is the kinase-inhibitory (KI) segment, which occupies the partner's active site, obstructing ATP and substrate binding, and disrupting the active site architecture (Zhao et al. l998; Tu and Wigler l999; Lei et al. 2000). Similar to N-WASP regulation, release of Pakl from its autoinhibited conformation is initiated by the binding of activated Rac or Cdc42 to the GBD. Binding of GTPase leads to an unfolding of the IS (Lei et al. 2000). This conformational change displaces the KI region from the Pakl catalytic cleft, exposing the activation loop and allowing for phosphorylation of threonine 423, which is required to achieve full kinase activity (Manser et al. l997; Fig. 2b). Additional phosphorylations occur at several sites in the Pakl monomer to further facilitate kinase activation (Buchwald et al. 200l; Chong et al. 200l). Once phosphor-ylated, Pakl monomers cannot reform the autoinhibited dimer until acted upon by protein phosphatases, such as POPX (Koh et al. 2002; Zhan et al. 2003). Fig. 2 Autoinhibition of Pakl. 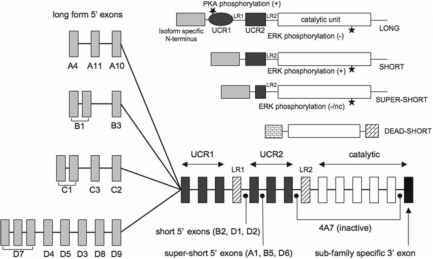 (a) The Pakl autoregulatory region (AR) consists of a number of sequence elements. The GTPase-binding domain (GBD) overlaps with the sequence of the inhibitory switch domain (IS), which anchors the autoregulatory domain to the kinase domain. The binding of the AR of one Pakl monomer to the kinase domain of another Pakl monomer leads to the formation of the autoinhibited Pakl dimer (left side of b). The kinase inhibitory (KI) segment intercalates within and disrupts the architecture of the partner's catalytic site. (Adapted from Lei et al. 2000). (b) Binding of activated Rac or Cdc42 to the GBD relieves the autoinhibitory interaction between the AR and the kinase domain, facilitating dissociation of Pakl monomers. Autophosphorylation of GTPase-bound Pakl completes the activation process and prevents reformation of the autoinhibited dimer of the IS domain within the autoinhibited Pakl dimer revealed a remarkable similarity to the WASP autoregulatory domain (Kim et al. 2000; Lei et al. 2000). In both the Pakl and WASP structures, this autoregulatory element binds a structurally analogous alpha helix in either the kinase domain or VCA segment, respectively. Thus, a structurally conserved regulatory module is utilized by both proteins to regulate distinct signaling activities. Given the structural and mechanistic similarities between these two proteins, it is possible that, like N-WASP, Pakl could be susceptible to inhibition by a small molecule that stabilizes its autoinhibited conformation.